In Stitchex all products, sales and production are arranged into seasons. You can switch between your seasons using the select drop-down at the top of any page. A season has a name (a short title, such as "Spring 18", works best), a start date and an end date. Examples of seasons could include Winter, Summer or Fall seasons. Or, if you plan to have different products each year, you may want a 2019 Winter season or 2020 Summer season. Seasons allow you and your customers to quickly find products. In addition to filtering and browsing, you will be able to run many reports "by season" (e.g. see how profitable you are by season or inventory reports by season). If you are planning to have products that are available year-after-year or not tied to a specific season such as winter, spring, summer or fall, you may want to give your Season name something more generic such as "Core Products". For more information in determining factors for your season names, see our Knowledge Article Managing Products & Seasons. When a season is over, it can be marked as "Hidden". This has the effect of hiding the season's products from various parts of your Stitchex account. 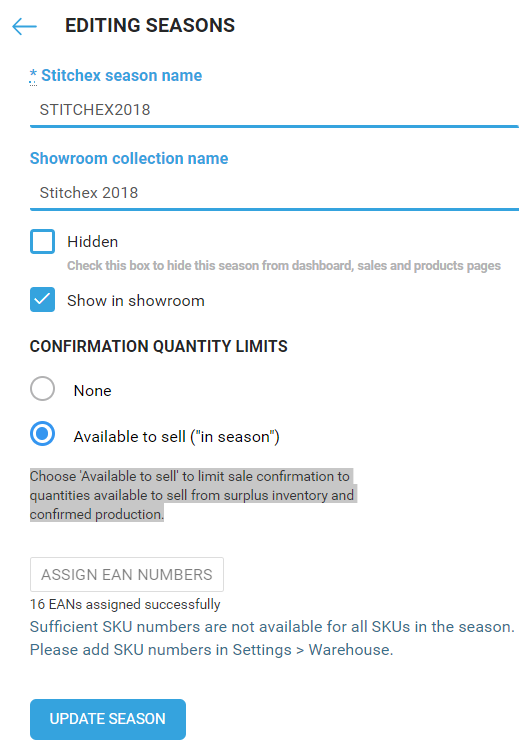 For example, hidden seasons will no longer appear in the drop down list when filtering for products within Sales Orders or even on the Products Lists view. Select this option if you plan to use the Season in your eCommerce/Showroom. For more details on how these settings can impact your Buyer's experience when they visit your Showroom/eCommerce store, see our Buyer Accounts - Getting Started and Showroom Season Display Order Knowledge Articles. If you plan to sell your product before production is complete or before you have "in stock" inventory, select "None" so that there are no restrictions for your Sales Orders. However, if you only want to be able to create Sales Orders for Products that you have available to sale from surplus inventory and confirmed Production, select, "Available to sell ("in season")". As example, you may have a customer that you want to pay a down payment before you ship product or release a production order to your manufacturing team. In this case, you would need the Confirmation Quantity Limits set to "None" or you will not be able to Confirm your Sales Order due to insufficient "in stock" inventories (if they are zero). Edit your Season by clicking on the edit icon (pencil) at the end of the row. On the right, select "Add Image"